Today we officially commenced our complete spring fishing patterns. Fishing charters out of Naples, Florida can now expect to have chances to catch King Mackerel, Cobia, Permit and Grouper for the next couple of months. King Mackerel have suddenly appeared on all of the offshore hangouts and several Cobia have also been seen with them. The deep sea fishing in Naples is as good as it gets right now. 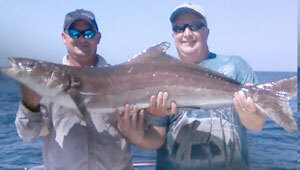 Grab this opportunity to hook-up on a fishing charter on The Alabama.